We are so excited to offer Ebooks for you to use at your gigs! We hope to slowly grow this collection and bring to you beautiful pattens by multiple artists. The books we have for sale are made for you to use as actual menus on the job. Download the files, print and use them for inspiration and design offering for your clients. 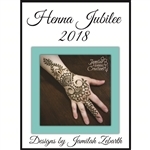 Jamilah Zebarth is the artist behind Jamilah Henna Creations based in East Hampton, CT. She has been working with henna since 2009, and specializes in flowy, flowery design. She is known for her flowers and festival designs. she enjoys Zentangle, reading, and book binding in her free time.